(Left to right.) 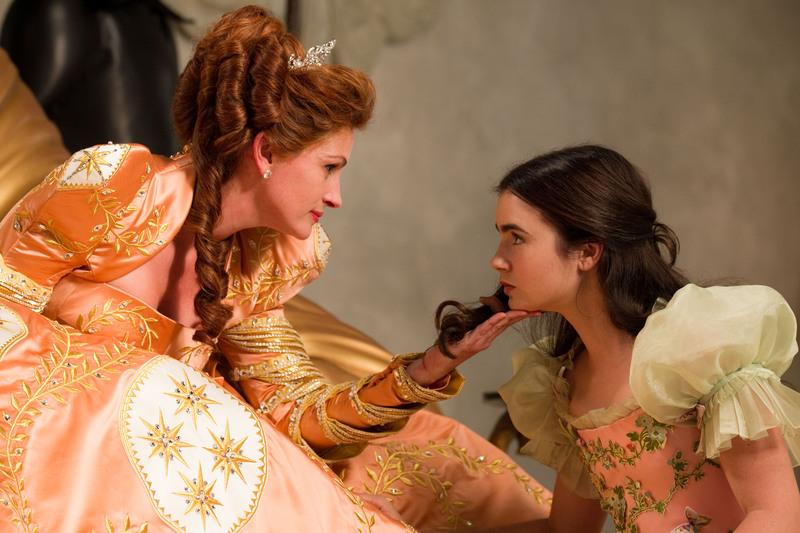 Julia Roberts and Lily Collins star in Relativity Media's Mirror Mirror. © 2012 Relativity Media. CR: Jan Thijs. HOLLYWOOD—For years, Julia Roberts played the ingenue, the girl-next-door audiences rooted for. Even the characters she played that were flawed also were usually empathetic such as her prostitute with a heart of gold in “Pretty Woman” and even the titular crusading whistleblower she played in “Erin Brockovich,” earning an Academy Award in 2000. Having played the protagonist for so many years, she now gets a chance to play an over-the-top villain in “Mirror Mirror,” directed by visionary filmmaker Tarsem Singh (“The Cell,” “The Fall”). As the evil Queen, she has jones for power, and the only thing she perceives keeping her from consolidating all the power in the kingdom is her beautiful young stepdaughter, Snow White (played by Lily Collins). Roberts, 44, admits she was a bit reluctant to tackle the iconic role but Tarsem offered her an appealing take on an oft-told fairy tale, and she wound up having more fun playing the antagonist than she expected. Front Row Features: Many of your films have been compared to modern-day fairy tales. Have you always wanted to do a traditional fairy tale like this? Julia Roberts: No, nor did I have any interest in this one really until Tarsem lured me in his luring way, and I looked at the script, and I realized there was really something here. Just the one sentence pitch of it on the phone, “Hey they’re doing a Snow White adaptation”—that didn’t grab my attention. Front Row Features: For this role, did you have to look for the evil Queen inside you? Roberts: I’m happy to announce she is not inside me, but without naming names, I drew from a couple of people I know better than I wish I did, and found it very fun and helpful. Front Row Features: Many actors say it’s fun to play the villain? Do you agree? Roberts: It was fun to play this villain because there aren’t any real rules of syntax or reality that apply to her, so I could kind of do anything and just go off the rails in any direction at any time, and it would make sense to me. In that regard, it was a lot of fun. You don’t have to worry too much about the reality of would a person really do this. Front Row Features: Charlize Theron also plays the evil Queen in the upcoming “Snow White and the Huntsman,” so hypothetically, if you took her on, who would win? Roberts: I’ve never met her, so I couldn’t even begin to size her up right now. Front Row Features: How did you and Lily get along? Roberts: I’m always friendly to Lily. We have a good relationship because (the antagonistic relationship in the film) was just acting. We almost tried to take better care of our relationship because of the nasty undertones and sometimes overtones of our scenes. Front Row Features: But you’re so mean to her onscreen. Roberts: I’m not going to lie. It was fun. Front Row Features: How did you like working with co-star Armie Hammer, who plays the prince? You two had some fun scenes together. Roberts: He’s good on the chin that one because you have to look way up. He’s so tall. He’s gone off to another movie now, so I don’t think we should give him too much attention, but he is wonderful. He really brought a very clever dimension to Prince Charming. He really could’ve just stood there and just talked and it would’ve been terrific, but he wanted to really be clever about it and put a lot of consideration into it. Front Row Features: You wear some beautiful costumes in this. Were they comfortable? Roberts: They’re stunning, and I think that they really are such an integral part of the production. It’s the same as having these amazing sets, being in these kinds of clothes. They were completely original and authentic to what we were trying to accomplish, and as Tarsem would say, in these great, huge spaces we needed to fill them in every way, and physically really dominate these spaces, so they had to be quite architectural. They weren’t terribly cozy, but that’s not really the point. Front Row Features: Are you going to let your kids see this or are they still too young? Roberts: I don’t think so yet. We have a pretty ridged viewing feeling in our house; we’re more book people (than moviegoers). We’ll find our time that’ll be happy and joyous for us to share it all together, but it probably isn’t in two weeks. Front Row Features: What’s your favorite fairy tale, and have you introduced your kids to them? Roberts: They have a lot of fairy tale books. They have such great illustrations in some of the old ones, and with proper parental editing when reading, they’re quite lovely before bed. Front Row Features: It seems a lot of celebrities say they limit their children’s TV and movie viewing as you do. Any ideas or insight as to why? Roberts: I don’t think I can offer insight. I can only offer you my thoughts on how we consider it in our home, which is just that those nice, cozy, very short hours before bed, we just really spend together as a family talking and sharing the day and reading books. Before you know it, it is time for bed. Part of it is there’s just not time for that. They do get to watch movies and I love movies and television. I was raised on television, but for us, we just feel there is a time and a place for it. Front Row Features: When you were first starting out in Hollywood, did you ever find yourself on the receiving end of any evil queen-type treatment from other actresses who still saw themselves as the fairest in the land? Roberts: Yes, but I wouldn’t limit it to just actresses. But those are good lessons to learn. You never ever want to behave like that to another person. Front Row Features: You spoke about how Tarsem convinced you to do it. Do you have specifics? What did he say to get you in this role, and at this point in your career, what is the criteria you use to decide whether you’re going to play a particular role. Roberts: It’s kind of the same criteria it’s always been. I am such a fan of his. When I heard it was his movie, his interpretation, I thought, “Okay, I’d love to meet him, and if I have to go and sit in there and talk about Snow White for an hour and then talk about other things, then that’s what we’ll do.” He had such a great take on it, and he has such a vibrant personality. I read the script, and I was really taken with it. Suddenly, I thought, “Oh, wait a minute. This is all kind of coming together in this unexpected way,” and off we went from there. Front Row Features: Do you have any beauty secrets to share, and what type of diet and exercise do you use to stay Julia Roberts? Front Row Features: The Queen speaks to her reflection in the mirror throughout the film, and the mirror serves as kind of her inner conscience telling her what’s really going on. Who do you sound off against to give you an honest answer as opposed to the answer you want to hear? Roberts: I always want to hear the truth, whatever it is. I’ve always felt that way, and I have an amazing family and a great group of friends, and that’s what I expect from them and rely on. It’s also what I look for in a great working relationship. I want people that will be honest and very plainspoken, and not beat around the bush with me. Just say this is what we need and this is what works and this is what doesn’t. That’s the best of life right there. Front Row Features: Disney’s “Snow White and the Seven Dwarfs” has been around for 75 years, and the evil queen is a classic villain character that audiences remember. So how do you unring the bell? Roberts: I don’t think it’s about unringing that bell. It’s just about changing the tone of it or just giving a different relationship to it. I don’t look particularly good in very big purple eye shadow and a Dracula collar, so we wanted to go a different route. I think people like variations on things. It’s funny when everybody makes such a big deal of there being two Snow White movies coming out, as though there had never been two movies with similar topics coming up at the same time. It’s like Noah’s Ark. They come two by two, the Capotes and the Snow Whites. It’s kind of just how it happened. It doesn’t seem surprising or upsetting to me.